Enterprise - Needles Channel - so calm! Title: Needles Channel - so calm! 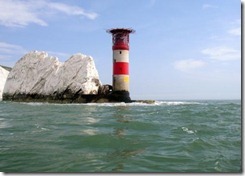 Left Gosport at 1600 on 26th May. Free at last!. The weather is beautiful, and the sea is calm. The Needles channel is as timid as it gets – we can see yachts anchored right up by the shore line taking the chance to sail in areas which are often totally out of bounds. We are going to go to Plymouth in one stage – getting practice in for watch keeping, and to monitor the performance and the power consumption of all the electronic gadgetry on board.